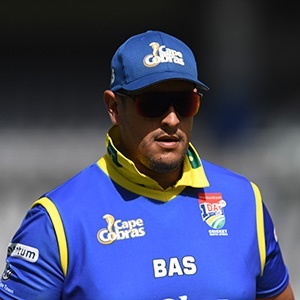 Cape Town - A maiden career five-wicket haul by veteran Rory Kleinveldt laid the platform for the Cape Cobras to secure their place in the One-Day Cup semi-finals thanks to a comfortable seven-wicket win over the Knights in Cape Town on Thursday. The 36-year-old seamer claimed an impressive five for 22 to help shoot out the visitors for 186 at Newlands, before Zubayr Hamza's unbeaten 65 (84 balls, 6 fours) guided the hosts to their target with 35 balls remaining. Victory guaranteed the Cobras a place in next week's play-offs after they moved to 20 points on the table, with the Knights (14 points) now having to beat the already qualified Titans on Saturday and hope other final round results go their way to have a chance of progressing. In a good showing in front of their home fans, Ashwell Prince's side were made to field first after losing the toss, but their opponents failed to make the most of their decision at the toss. Captain Pite van Biljon managed just 14, before he too fell, with Rudi Second (49) and Grant Mokoena (44) then doing their best to try and stabilise things with 40s apiece. That did momentarily give the Knights hope after they progressed to 118 for four - the pair adding 73 for the fifth wicket.